The Frugal Burqueño: Dinner for Two only $ 4.00 ! Dinner for Two only $ 4.00 ! This is a great deal all frugal Burquenos should know about! You can purchase many different kinds of delicious Polish pierogi (Kasia's Deli, Inc.) from EuroZone Food Distributors for only $ 3.90- 4.00 per package! 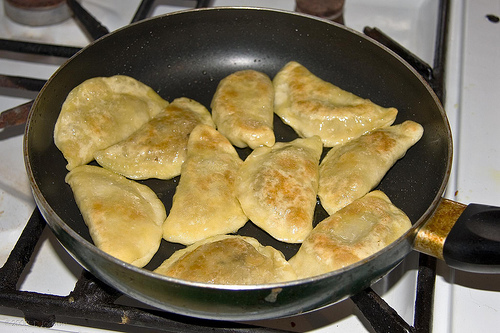 One package (14 oz) includes 12 pre-cooked homemade pierogi made with all natural ingredients. It will easily serve as a dinner for two people (add some salad or sauce, fry them in onion, etc.). Last night I had the ones with spinach (so tasty!) and there are many other kinds: potato & cheese, potato & onion, potato & cheddar, potato & cheddar with jalapeno (yay! ), potato & bacon, sauerkraut pierogi, cabbage, kraut & mushrooms and more! They are easy to prepare: just heat and serve :-) But don't overcook because it decreases their great quality. If you need more information about where to buy the best pierogi, leave a comment and I'll get back to you :-) Enjoy! OMG there are the best. Pierogi are not only really good, they're easy to cook up and fast! This is my dinner when we have nothing else in the house! Love it.